When your cat refuses to eat, you need to call your veterinarian for an appointment immediately. Some causes for not eating (anorexia) are simple to treat, and others are more complex to identify. Either way, you need to call your veterinarian and have your cat examined. Fortunately, many conditions can have a positive outcome with timely and appropriate medical care. Your veterinarian will ask you questions about what you have noticed regarding your cat’s loss of appetite. Have you recently changed the food your cat was used to eating? Have there been any major changes in your home, like the addition of a dog or another cat? Could this be frightening your cat and causing her not to feel comfortable to eat? 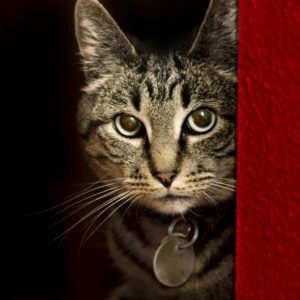 Have there been changes in your cat’s urination or defecation lately? Were there any loose stools? Has your cat been drinking extra water? During the physical examination, your veterinarian will look for things that might be causing your cat’s lack of appetite. They will look in your cat’s mouth to see if there is any dental disease which might cause your cat to not want to eat. They will take your cat’s temperature to see if your cat has a fever and perhaps has an infection, also leading to a lack of appetite. Often samples of blood, urine, and stool are examined to help your veterinarian determine the cause for the decreased appetite. Your veterinarian may need to do further diagnostic tests like x-rays or an abdominal ultrasound to be able to see why your cat is not eating. Kidney Disease – when the kidneys stop working well. Kidney disease can also be caused by eating poisonous substances, such as certain plants (e.g. lilies or plants of the Lilium species) or certain medications (e.g. pain relievers). This can happen at any age. In either case, when kidney function starts to decline, toxins the kidneys would normally filter out will start to build up in the blood. This can make your cat feel nauseous and cause stomach ulcers. Pancreatitis – inflammation of the pancreas (an organ). Cats usually do not vomit from pancreatitis. It is far more likely that they will stop eating and seem lethargic (have less energy) and depressed. Most cats with blood sugar readings too high (hyperglycemia) or too low (hypoglycemia) actually have an increased appetite. However, appetite may decrease if your cat has other issues common to diabetic cats such as pancreatitis and urinary tract infection. Low blood sugar can happen if too much insulin is accidentally given (e.g. two people in the house give it). High blood sugar can occur if you forget to give the insulin. Both low or high blood sugar can occur if the wrong type of syringe is used or if your cat’s insulin needs have changed. The insulin need may decrease if he goes into diabetic remission or increase if he develops other medical problems, like a bladder infection. Feline hyperthyroidism is the most common endocrine disorder in middle-aged and older cats. Hyperthyroidism is a disease caused by an overactive thyroid gland that secretes excess thyroid hormone. The excess thyroid hormone causes an overactive metabolism that stresses the heart, digestive tract, and many other organ systems. Weight loss despite a normal or increased appetite is a symptom when hyperthyroidism is advanced. Although most cats with hyperthyroidism lose weight despite a normal or increased appetite, some cats with hyperthyroidism, especially if they have other concurrent health issues, may actually have a reduced appetite. Whenever you notice a change in your cat’s behavior such as not eating, you need to call you veterinarian immediately. They can help diagnose any medical condition and help your cat to feel better as quickly as possible. As a team, you and your veterinarian will determine why your cat is not eating and decide the best treatment protocol to help your cat to start eating again. Other health conditions, such as heart, dental, intestinal, or liver disease can also lead to reduced appetite in cats, with or without other symptoms.